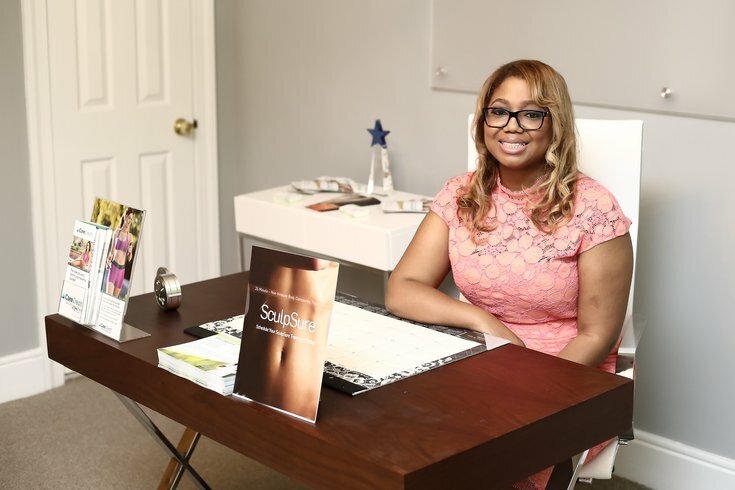 Dr. Lisa Ashe, a Philadelphia native who runs a concierge medical practice serving the Washington metro area, decided to freeze her eggs at age 36, saying it allows her extra time to find the right partner. Dr. Lisa Ashe spent the entirety of her 20s completing some form of medical school or training. Getting married and starting a family were nowhere near the top of her to-do list. Nor were they at age 31, when she began her career as a traveling physician. "I really was so happy to be done and to have a paycheck now that I just decided I wanted to travel the world, and I wanted to shop," said Ashe, a Mt. Airy native who now runs a concierge medical practice serving the Washington, D.C., metro area. "I didn't really want to think about having a child." Now 36, Ashe knows she wants to start a family, but she also wants to find the right partner. Freezing her eggs – a technology increasingly gaining in popularity – offered Ashe an opportunity to extend her timeline for both. "I see a lot of people, when they get to their late 30s, in a rush to get married," said Ashe, who also is a Baptist minister. "They settle or they quickly pick someone. I feel like who you marry is the most important decision you can make because it will affect all aspects of your life. "My faith tells me – and I believe it – that God has someone specific for me. I look at egg freezing as a resource for me, to help me wait." Egg freezing, known formally as oocyte cryopreservation, has gained particular popularity since the American Society for Reproductive Medicine removed the "experimental" label from the procedure four years ago. The technology initially was viewed as a resource for women facing aggressive cancer treatments. But seemingly more and more healthy women are freezing their eggs as a way to expand their reproductive options. Nearly 4,000 women opted to have their eggs frozen in 2013, according to the Society for Assisted Reproductive Technology. That obliterated the total from 2009, when just 475 women made the same decision. On a broader scale, women underwent some 27,000 cycles dedicated to freezing eggs or embryos in 2013, said Dr. Samantha Butts, an associate professor of endocrinology and gynecology at Penn's Perelmen School of Medicine. That total had more than doubled from 12,000 cycles in 2011. "I've seen a significant upturn in the questions that I get as a reproductive endocrinology specialist from women who wish to freeze eggs for the purpose of gaining some control over their reproductive futures," Butts said. The process requires hormone treatments necessary to stimulate ovaries and ripen multiple eggs, which are later removed by a needle in a non-surgical procedure. The eggs are then frozen through a rapid freezing process called vitrification. Current research does not indicate any increased risk of pregnancy complications or birth defects in women who conceive using frozen eggs. Yet, the American Society for Reproductive Medicine warned women against using egg freezing as a sort of reproductive insurance policy, noting frozen eggs offer no guarantees to a future pregnancy. "We want to be the arbiters of good, accurate information," Butts said. "We want to empower women, so they're making decisions from a position of power and not scarcity." That entails alerting patients to the somewhat unknown success rates of the technology and its expensive price tag. Studies show that more than 80 percent of eggs survive the freezing and thawing processes, according to Penn Medicine, which has its own egg freezing program. About 70 percent of thawed eggs can be successfully fertilized. Pregnancy rates stand above 40 percent when one or two embryos are transferred in young patients. Success rates have grown comparable to those of fresh eggs, according to the American Society of Reproductive Medicine. But the current rates are mostly gleaned from studies of young women who froze their eggs for donation purposes. Until this latter – but surging – group of women begins claiming their frozen eggs, data on the technology's effectiveness will remain less definitive. "We see a number of women who come in because they're interested in freezing their eggs," Butts said. "What we haven't seen yet is a comparable number of women who are thawing their eggs." Price remains another significant factor women must consider before freezing their eggs. Costs vary by clinic, state and insurer. But Butts instructs her patients to budget at least $10,000, plus additional money for storage fees. Thawing, fertilization and implantation also cost thousands of dollars on the back end. "The costs related to these things are not trivial," Butts said. "I think every person has to determine if they have both the emotional and financial wherewithal to proceed with a treatment like this." Most insurers do not cover egg freezing, forcing many women to pay out of pocket. But that may be changing. Two years ago, Facebook and Google made headlines when they each announced they would fully cover the procedure. Some praised the tech giants for expanding women's healthcare options. Others decried the policy, accusing the companies of disincentivizing women from starting families. Ashe falls on the former side of that argument. "I'm always for people, and especially women, having options," Ashe said. "As women, you feel a lot of pressure to get married and a lot of pressure to have children. ... That pressure is always there. If this is something that helps relieve some of that pressure, I think that's a good thing." Ashe advocates for expanded conversations regarding egg freezing. As a physician, that conversation can happen privately – and regularly – with her patients. But broaching the subject in her other community circles also could be beneficial, she said. "There is a stigma when we talk about fertility, especially in the African-American community and in the Baptist community as a whole," Ashe said. "Women don't tend to talk about it, and they kind of say, we'll just wait for God and there's nothing you can do. That's not the case. There are things you can do." For Ashe, who earned her masters of divinity from Virginia Union University earlier this year, the difficult question is not reconciling egg freezing with the teachings of her Baptist faith. "I feel like egg freezing is a no-brainer," Ashe said. "The question that is hard for me is what happens if I'm 42 or 45, and I'm not married? Do I use the eggs or do I not use the eggs? That's a harder question for me, and I still haven't reconciled it." In that scenario, using the eggs would require a sperm donor, likely from a stranger. She also would be raising the child on her own. The debate bounces back and forth within her head. But at the moment, Ashe said, "I get the sense that I should be waiting."